This shift pattern is imprinted on the shift knob. The transaxle is fully synchronized in all forward gears so shifting to either a higher or a lower gear is easily accomplished. Depress the clutch pedal down fully while shifting, then release it slowly. 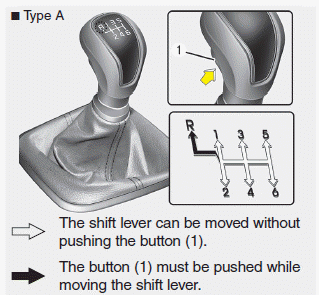 The shift lever must return to the neutral position before shifting into R (Reverse). 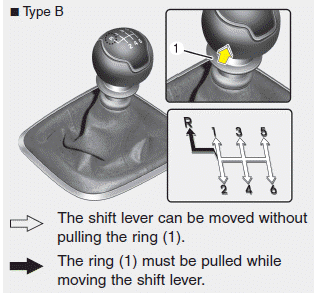 The button located immediately below the shift knob must be pushed upward (Type A) or the ring located below the shift knob must be pulled upward (Type B). while moving the shift lever to the R (Reverse) position. Make sure the vehicle is completely stopped before shifting into R (Reverse). Never operate the engine with the tachometer (rpm) in the red zone. When downshifting from 5 (Fifth) gear to 4 (Fourth) gear, caution should be taken not to inadvertently move the shift lever sideways in such a manner that second gear is engaged. Such a drastic downshift may cause the engine speed to increase to the point that the tachometer will enter the red-zone. Such over-revving of the engine may possibly cause engine and transaxle damage. Do not downshift more than 2 gears or downshift the gear when the engine is running at high speed (5,000 RPM or higher). Such a downshifting may damage the engine, clutch and the transaxle. When shifting between 5th and 6th gear, you should always push the gear level all the way to the right. You could otherwise shift unintentionally into 3rd or 4th gear and damage the transaxle. During cold weather, shifting may be difficult until the transaxle lubricant has warmed up. This is normal and not harmful to the transaxle. If you've come to a complete stop and it's hard to shift into 1 (First) or R (Reverse), put the shift lever in neutral position and release the clutch. Press the clutch pedal back down, and then shift into 1 (First) or R (Reverse) gear position. To prevent possible damage to the clutch system, do not start with the 2nd (second) gear engaged except when you start on a slippery road. Before leaving the driver’s seat, always set the parking brake fully and shut the engine off. Then make sure the transaxle is shifted into 1 (First) gear when the vehicle is parked on a level or uphill grade, and shifted into R (Reverse) on a downhill grade. Unexpected and sudden vehicle movement can occur if these precautions are not followed in the order identified. If your vehicle has a manual transaxle not equipped with a ignition lock switch, it may move and cause a serious accident when starting the engine without depressing the clutch pedal while the parking brake is released and the shift lever not in the neutral position.